Cleaning up God, however, has proved to be well nigh impossible. Even in the most banal formulas of worship, vestiges of the tribal god who had a name remain: “In the name of the father, son, and holy ghost.” Most folks today don’t seem to think of God having a name, but it’s still there, in disguise. In the RSV, whenever you see LORD—the word in all caps—this is a rendering of Yahweh. And the Jehovah’s witnesses brandish the name proudly: Jehovah is Yahweh with different vowels. By far the biggest challenge for Christian apologists is disguising the ferocious god described in the Bible. They’ve worked so hard to conjure the lofty, decent, compassionate God—his eye is on the sparrow—that people crave today; the God whose everlasting arms will welcome them to heaven. But the Old Testament, with Noah and so much more, won’t go away; Christian apologists have rallied to the cause of making Yahweh look good. It’s hard to believe they stoop as low as they do, hoping—I guess—that their target audiences won’t notice the subterfuge. 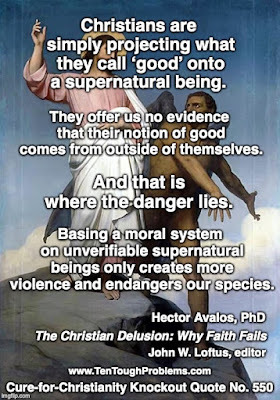 Their stratagems call to mind a cliché from my childhood in the 1940s, when we heard the creepy voice on the radio, “Who knows what evil lurks in the hearts of men?” Apologists showcase evil in the form of lying, well, shallow scholarship at least, and stunningly grim theology. We can assume that even many pious folks have stumbled over this text. Is God really like that? Maybe this in one of those places where the Bible gets it wrong? But the more severe professional apologists, who probably should be under surveillance by right-wing watch, know that throwing shade on the Bible just won’t do. So, now we at least know what evil lurks in the hearts of some Christian apologists. 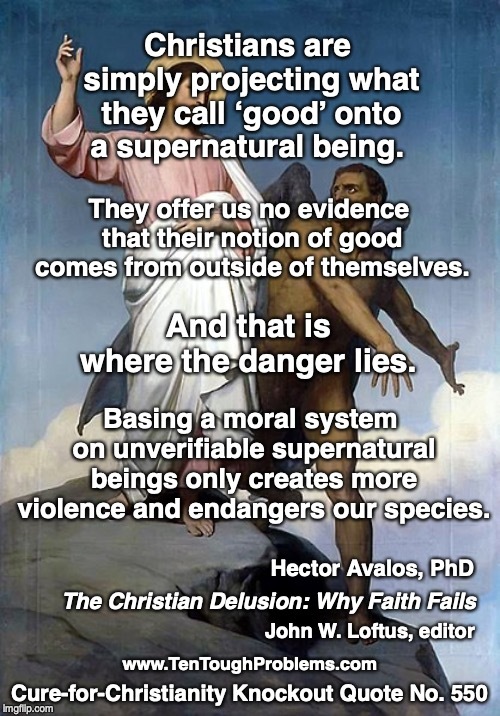 Their approach aligns with the argument, sometimes advanced by extreme defenders, that anything God does has to be good. Who are we to judge? In fact the main thrust of the Avalos essay is an analysis of Paul Copan’s deceptive apologetic approach. One problem for zealous apologists is that the milieu of the Old Testament is now well known. For example, the Noah story must now be understood against a cultural heritage that included the Epic of Gilgamesh, which has a flood narrative. But how does Old Testament law measure up to other legal traditions of the Ancient Near East? Of course, the Bible has to be better, which means that Copan takes on the Code of Hammurabi and other texts, to illustrate the superiority of the Bible—and fails, because of his shallow knowledge and apparently, his assumption that his evangelical audience won’t know any better. How can this not be dishonesty? How can this not represent an erosion of decency? Of course, a major challenge for apologists is that they cannot transform the Bible, even with all the ingenuity in the world, into something it isn’t. Namely, a coherent document that throws the clear light of day onto who and what God is. Those of us raised in the Protestant tradition have been taught from an early age that we can just ‘open the Bible’ to find out about God. But I faced a reality check when I got to seminary; some of my professors didn’t try to fake it: a ‘theology of the Bible’ is impossible since it is a maddening jumble of contradictory God-ideas. It begs the question, moreover, of why God couldn’t have got things right from the very beginning! If he is the perfect divine author, how could so many barbarities and brutal laws have slipped into the Bible—presumably by mistake!—requiring gradual improvement, a trajectory. “…Abraham seems to assume that child sacrifice is not an impossible request, and it is the substitution of the lamb that is unexpected. For most of Biblical history, Yahweh was not against child sacrifice per se, but rather against child sacrifice to other gods.” (p. 227) And it was the nasty-tempered God of the Exodus story who killed all the first born of Egypt. How can apologists pretend that the Bible is a morally superior document? At the outset of his essay, Avalos notes that Copan and other apologist have their knickers in a twist because of the so-called New Atheism. What a fright to have blockbuster atheist books (e.g., Dawkins, Hitchens, Harris) on the best-seller lists. The only “new” thing about this atheism is that it is so in-your-face, with many other authors in their wake adding their voices. By my own count—by no means complete—there are now well more than 300 titles in this bibliography, books that have appeared since the 1990s (my own term for it is The-Cure-for-Christianity Library©). Avalos notes three reasons that the apologetic counter-attack is not up to the task.